Are all dry cleaners the same? What service do you provide to account customers? How do I arrange a regular collection service? Do you provide same day cleaning? Is it good for my clothes? No. Like most things in life the quality of dry cleaning is directly related to the price you pay for it. There are many dry cleaners that dry clean for very low prices and the cleaning quality, quality control and end result will probably be reflected in those low prices. If you have expensive clothes it makes sense to have them cared for by a company that has experience in dealing with them. We clean designer clothes all day long, we understand that the creases on an Issey Miyake shirt are a style statement -- some cleaners don't! By using a specialist you ensure your clothes receive the best possible care. There are plenty of areas where cleaners can cut costs: using old machinery, using cheaper solvents and soaps - we don't make these compromises. The ultimate benefit of this is that your clothes receive the best possible care. The greatest skill in dry cleaning revolves around stain removal. While a specialist can't guarantee the removal of all stains, experience teaches them what techniques to use and how far they should go in terms of stain removal. It's a fine balance between results and safety and by using a specialist you get the best risk:reward balance. We can provide weekly, bi-weekly and an on demand collection and delivery service to our customers in many parts of London. Just give us a call on 020 7431 3725 or email us info@themastercleaners.com. Then we can discuss your requirements and tailor an appropriate service package. To provide a quality service takes time. We ideally like 2-3 days to allow us the time to give your garments the care and attention they deserve. This allows us to re-clean garments if necessary to achieve the best results. If you require a same day service we will try and accomodate you if we can. Contact us for more information. During dry cleaning garments are immersed in a liquid solvent, the abscence of water is why the process is called 'dry' cleaning. 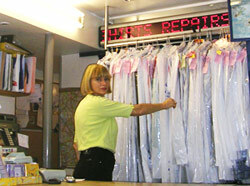 Garments are assessed prior to being dry cleaning and pre-treated using appropriate solvents and techniques to remove stains. After this they are placed in a dry cleaning machine. This serves to remove the solvents used during pre-treatment and then uses solvents and soaps within the dry cleaning process to dissolve stains such as grease. Garments are inspected after cleaning to determine whether they require further treatment. Once we are satisfied with the results we press the garments by hand. Yes. Dry cleaning provides a clothes care solution to garments that can't be washed without a risk of damage to them. Grit, dust and grease can damage fabric if a garment remains untreated. Dry cleaning serves to extend the life of your garment by making them look as good as they can.